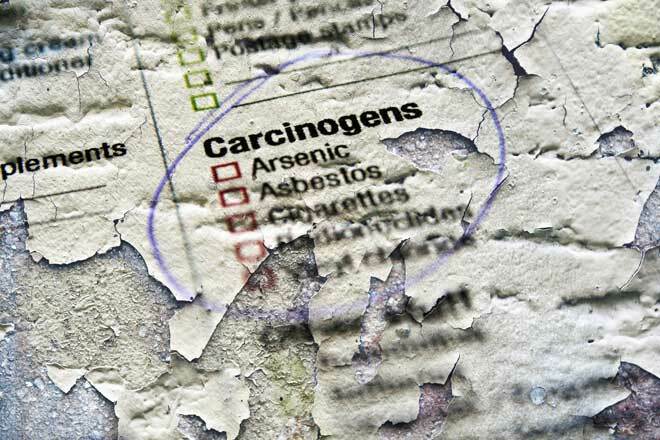 If you’re considering renovating an older home, asbestos is one of the most insidious dangers you’ll need to look out for. Cheap, durable, fire-resistant, and an excellent insulator, asbestos is a naturally occurring mineral fiber that was commonly used in homes from the late 18th century all the way to the mid-1970s. As early as the 1920s, however, evidence began to mount that showed inhaling asbestos fibers causes scarring in the lungs. Since then, this fiber has been conclusively linked to several types of cancer. Identifying and correctly handling any asbestos in your home is a must to protect your health before you start even a minor repair job. Definitively identifying asbestos requires help from a qualified professional, but you can still estimate how likely your home is to contain asbestos and where it might be. The first clue is your home’s age. Between the late 1960s and 1989, a number of government regulations were instituted that effectively prohibited the use of asbestos in most residential building materials. Any house built before 1990 could have asbestos, and those built in the 1960s are at the greatest risk. If your house was built after 1973, there’s a chance it could contain asbestos, but it’s less likely. If any of these materials were installed in your home before 1990, they could contain asbestos. Disturbing these materials can release harmful amounts of asbestos, so you’ll need an asbestos assessment before any home improvements such as upgrading your attic insulation, replacing your popcorn ceiling or tearing out old vinyl flooring. Friable – This material crumbles easily and includes vermiculite insulation, low-density fiberboard, and underlay for vinyl flooring. Non-friable – In this type of material, the asbestos is sealed in and won’t break down easily. This group includes cement products, such as corrugated sheeting, and vinyl floor tiles. Before you inspect any area you think might be harboring friable asbestos, wear disposable protective clothing that fully covers your skin and hair, safety goggles, and a respirator. You won’t notice any immediate effects if you skip the protection, but you’ll be putting your future health at risk. 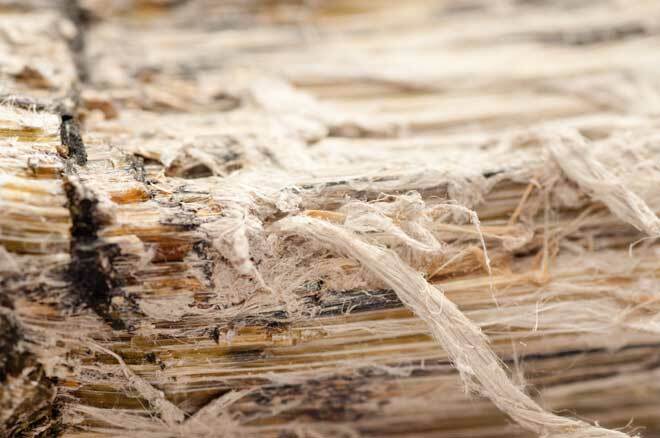 You’re most likely to find friable asbestos in your attic insulation and pipe insulation. The most common source is vermiculite insulation, which looks like grayish-brown pebbles of around 1/4-inch across. Another is asbestos pipe insulation. Corrugated asbestos pipe insulation resembles corrugated cardboard, while asbestos magnesia block insulation looks like crumbly white stone. If you find these or any other potentially asbestos-containing material that’s begun to deteriorate, don’t disturb it. Call a professional for guidance. To determine if a material in your home contains asbestos, you’ll need to send samples to a facility certified to perform testing through Polarized Light Microscopy (PLM) or Transmission Electron Microscopy (TEM). The National Institute for Standards and Technology (NIST) maintains an online database of qualified Asbestos Fiber Analysis facilities. You can collect samples to send in yourself following proper safety procedures, but you’ll be safer hiring a contractor certified to handle asbestos. Once you know where the asbestos in your home is, a qualified professional can advise you on what your next step should be. There are two ways to handle asbestos. 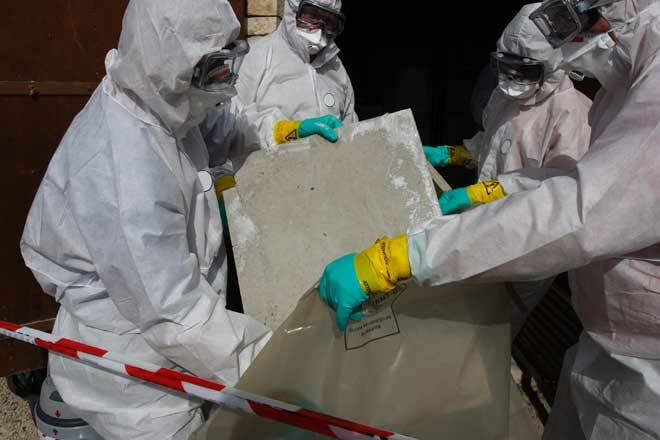 Encapsulation – Asbestos isn’t harmful unless it’s exposed to air, so you won’t necessarily have to remove non-friable material that’s in good condition. Instead, you can have this material sealed with an encapsulant to hold in the asbestos. Even minor damage, such as a tear in pipe insulation, can be repaired and encapsulated. You won’t be able to drill, saw or otherwise alter this material because doing so will release asbestos. 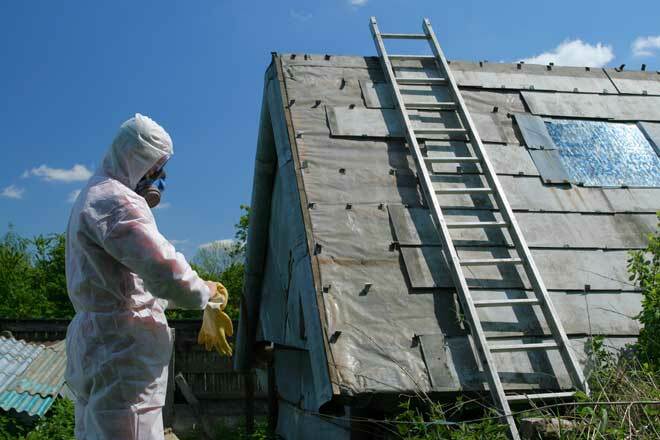 Abatement – This involves completely removing the material containing asbestos. Depending on your local regulations, you might be allowed to remove small amounts of asbestos-containing material yourself. If you decide to take on this job, take strict precautions to protect yourself and avoid contaminating your home. Prepare the area – Seal off your work area with 200um plastic sheets (builder’s plastic). Remember to seal the HVAC vents and light wells, too. Secure the plastic with duct tape. Remove any soft furnishing, clothes, and children’s toys. If you’ll be working outdoors, lay plastic sheeting on the ground under your work area. Wear protective gear – Wear disposable coveralls with a hood, along with a hat or other hair cover, gloves, rubber boots, safety goggles, and a P100 (asbestos-rated) respirator. No part of your body should remain exposed. Remove the material with care – Use a spray pump to dampen the material you’ll be removing to hold down dust. Use only manual tools. Power tools can release asbestos fibers. Collect the material in a heavy plastic bag and seal the bag while you’re still in the work area. Take it outside and, after clean-up, haul it to a facility that accepts asbestos. Clean up thoroughly – Mop and damp dust the area with disposable cleaning tools. If you vacuum, use only a vacuum equipped with attachments that can handle asbestos dust. It’s safe to wipe down rubber boots, but ideally, your other work clothes should be thrown out with the asbestos-containing materials. By trying to wash them, you risk contaminating the rest of your house. When you’re finished, take a shower to remove any asbestos that reached your hair or skin. Removing more than around 100 sq. ft. of material is a job best left to the professionals. Incorrect handling of this much building material can spread asbestos fibers not just around your house, but even over to your neighbors’ homes. The average remodeling contractor isn’t trained or properly equipped for safe asbestos removal, so you’ll need to call in licensed and certified residential asbestos abatement contractors. Your contractors will start the job by using builder’s plastic to completely seal off the area where they’ll be working to prevent asbestos fibers from escaping. They might also put up barricade tape and warning signs to keep people out. With that done, they’ll set up a negative air machine equipped with a HEPA filter, essentially a large fan, to draw air out of the work area. This creates negative pressure that holds back any asbestos fibers that become airborne, so they don’t spread to other rooms. 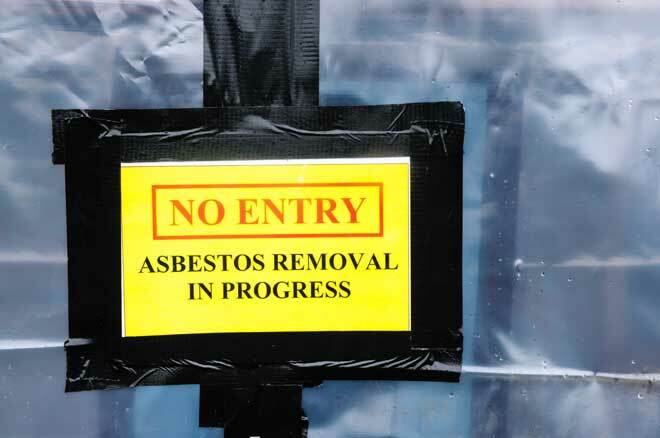 Wearing protective clothing and respirators, the contractors will enter the sealed-off area and wet down the asbestos-containing material with amended water (water with an added surfactant) to reduce the risk of asbestos fibers becoming airborne. After this, they’ll tear out the asbestos-containing material and place it into sturdy bags, which are then sealed and loaded into a truck or container destined for a qualified disposal facility. Once the material is gone from your home, your contractors will vacuum and wipe down the work area, then apply an encapsulant to seal the area so no lingering asbestos fibers can enter your air. Depending on local regulations, you might still have to call in an independent company to test the area and give you the final all-clear to go ahead with your renovation work. Asbestos exposure is a real risk if you live a home built before 1990. Not only can renovations and remodeling work expose you to this harmful mineral fiber, but so can deteriorating flooring and other materials. By finding out where the asbestos is and taking steps to manage it, though, you can enjoy your older home in safety and good health.